Proctor & Gamble employs 130,000 workers in 80 countries, offering a variety of consumer products under an array of brand names. In 2005, this $55 billion company acquired Gillette, a Cincinnati, Ohio based company which provides razors, Oral-B dental health products, Braun shavers, Duracell batteries, and various small appliances. 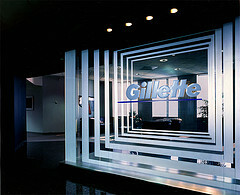 Gillette’s distribution center for products sold in the United Kingdom is in Reading.